By far pizza has become America's favorite food over the past 50 years. Millions of pizza pies are eaten daily, but how often do the people eating the food stop to consider the history. The true origins of this fine cuisine are as colorful as any good pizza pie heaping with toppings. The common belief is that Italians invented the pizza, however the origins go back to the ancient times. Even though we have yet to uncover archeological evidence of a Dominos Pizza before the last century, it is known the Babylonians, Israelites, Egyptians and other ancient Middle Eastern cultures were eating flat, un-leaven bread that had been cooked in mud ovens. The bread was much like a pita, which is still common in Greece and the Middle East today. Further it is known that ancient Mediterranean people such as the Greeks, Romans and Egyptians were eating the bread, topped seasoned with olive oil and native spices. The lower class of the Naples, Italy is believed to have created pizza in a more familiar fashion. In the late 1800s a Italian baker named Raffaele Esposito, was believed to have created a dish for visiting royalty. According to the story, the Italian monarch King Umberto and his consort, Queen Margherita were touring the area. In order to impress them and to show his patriotic fervor Raffaele chose to top flat bread with food that would best represent the colors of Italy: red tomato, white mozzarella cheese and green basil. The king and queen were so impressed that word quickly reached the masses. The end results were that the dish was well received to the extent that others began to copy it. By the beginning of the 1900's pizza made it's way to the inner cities United States, thanks to Italian immigrants, most notably New York and Chicago, due to those cities having large Italian populations. Small cafes began offering the Italian favorite. American soldiers further prompted the dish to become very popular at the end of World War II, having been exposed to it while serving on the Italian front. Dirt Road Cookers is making its' mark on history too. 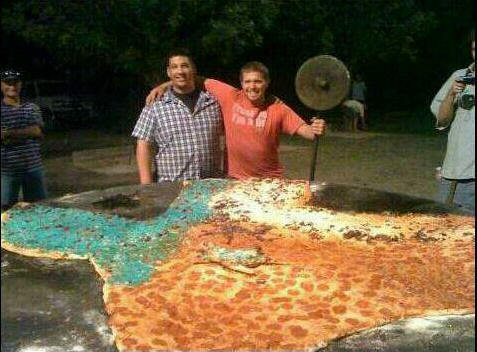 We are the "largest commercially available pizza". You can't mess with Texas, but with Dirt Road Cookers; you can try to eat it!